Truck platooning is still a new technology to many, so it’s understandable that there’s some confusion about it. One misperception is that platooning is a far-distant technology that faces serious uphill battles on the regulatory front. Some people even believe, erroneously, that platooning has actually been banned by some or most states in the United States. In truth, no states have enacted bans against truck platooning. What’s true is that existing laws and regulations for the trucking industry were written before anyone envisioned platooning. What’s also true is that updating those outdated regulations is an ongoing process that is swiftly proceeding. The first category, affecting 24 states, specifies a minimum gap — measured in number of feet or timed headway — that trucks must maintain while traveling on roadways. The second category, on the books in 26 states, offers discretionary following-distance guidelines. Generally, these laws mandate that trucks maintain a ‘reasonable and prudent’ following distance between themselves and other vehicles. 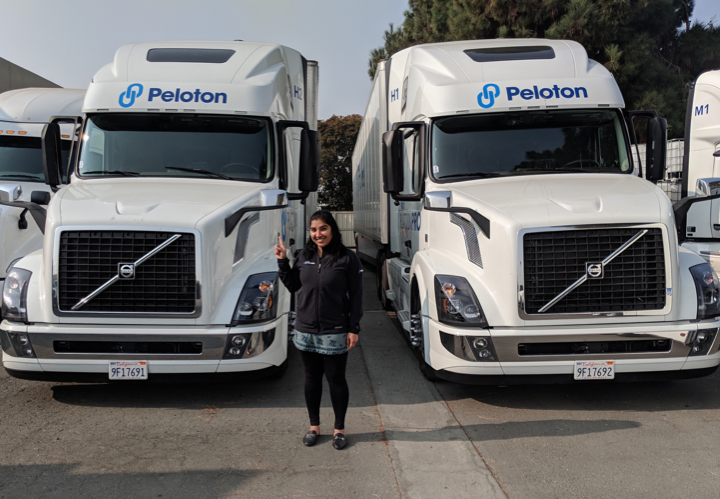 Peloton’s platooning technology allows trucks to maintain a 40’ to 60’ gap, which is a shorter following distance than defined in the first category of laws. Because of this, multiple states in this category have updated their laws to allow platooning. We interpret the second category of laws to allow platooning under current law. For clarity, some states in this group are making explicit an allowance for truck platooning within their boundaries. A total of 17 states — governed by a mix of both categories of regulations — have either passed laws that explicitly allow platooning or administratively determined that platooning is permissible under existing law. 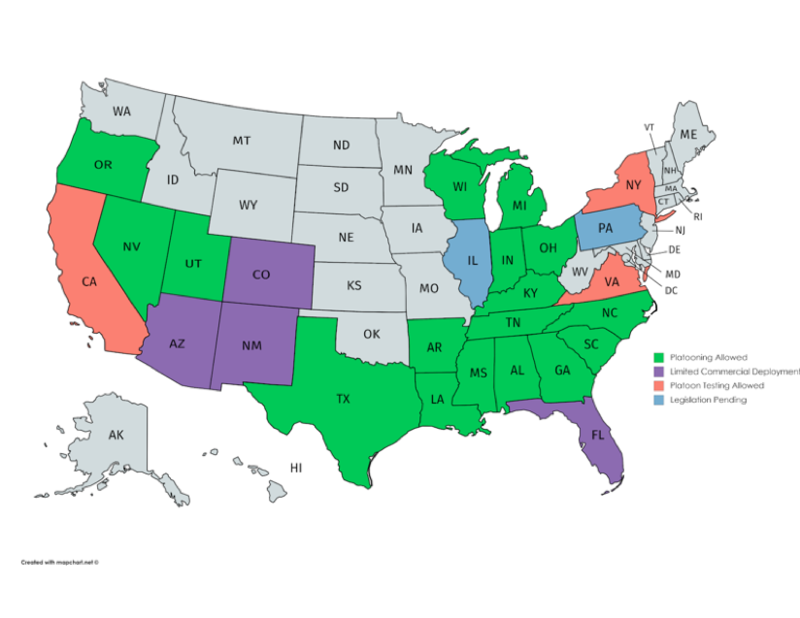 Another seven states allow limited commercial deployment or testing of platooning technologies, and two states have legislation pending that would allow platooning. Here is a map that depicts these developments. Truck platooning creates fuel savings. The more states where platooning is allowed, the greater the cumulative savings. Our data suggests that platooning can improve truck safety, and the march of states opening to platooning unleashes this platooning safety potential. Entire corridors are opening to platooning — enabling fleets to boost profitability throughout these routes. States that permit platooning become more appealing to truck fleets, which can help states earn a larger percentage of trucking fleets’ business. The momentum has moved decidedly toward greater adoption of truck platooning. As more states clarify their regulatory posture to allow platooning, we’ll provide periodic updates. 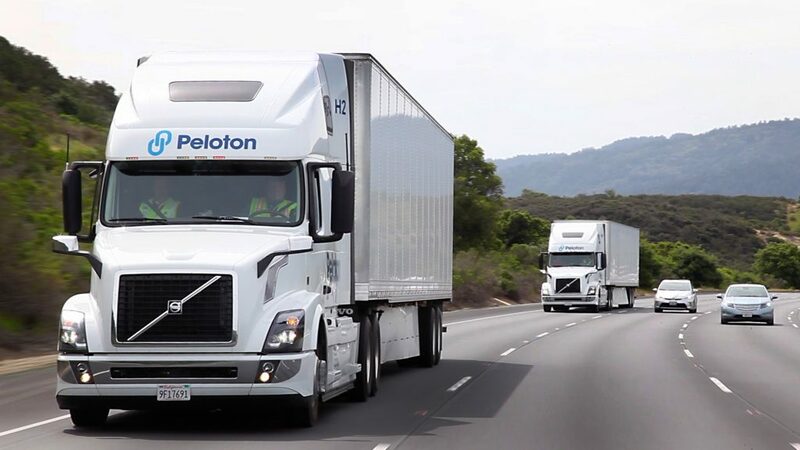 In the meantime, learn more about the Peloton platooning experience and how it can help professional drivers and fleets save fuel safely. © 2018 Peloton Technology. All rights reserved.